Much of what we do today relies on other people – other people who don’t work for us. 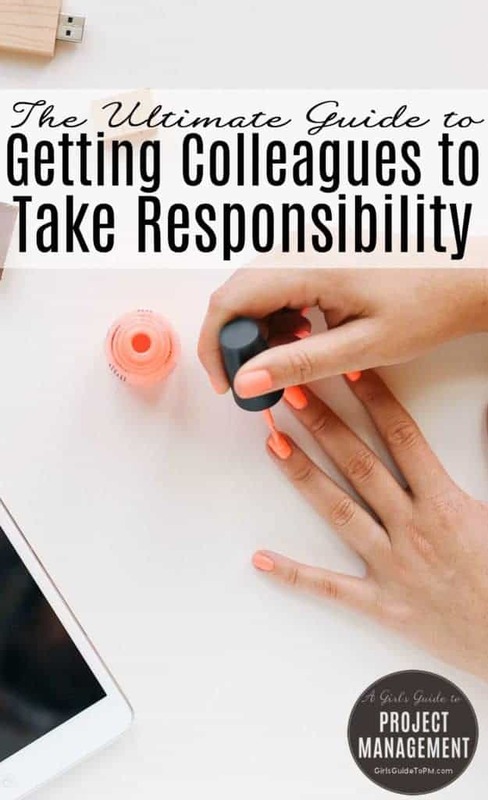 Whether it was as part of a project or another professional interaction, I’m sure you have met colleagues who aren’t taking responsibility at work for their tasks. It’s a pain to work with coworkers who won’t step up. It means your job turns into micromanaging, spoon feeding and generally running around after people who probably earn quite enough to be operating in a more professional manner. It takes up a lot of time too: time that could be better spent doing your own job. If this sounds like your work environment then there are things you can do to change it. In this article we’ll look at why people don’t take responsibility for tasks and also how you can influence the culture of the office so that taking responsibility becomes the norm. I should say now that changing behaviour is hard work. I don’t promise to be able to do it in 1500 words, but there are some fool-proof strategies coming up that you can start putting into practice today. Why don’t they take responsibility? Unfortunately there isn’t a clear cut answer to this. There could be any number of reasons why someone isn’t taking full responsibility for their tasks, even if their job description says they should. You’ll have to have a conversation with them about their performance to try to uncover why they aren’t pulling their weight on the team. Here are 7 reasons for people shirking their workload and what you can do about it. They have never been given responsibility before so they don’t know what to do now they have it. You can: Be clear that they are responsible. Tell them that they have the authority to make decisions and in what situations. A roles and responsibilities document or a RACI matrix can help with this. Once they have signed up to their job description and the responsibilities that brings, hold them accountable. You might be pleasantly surprised by their change in attitude once they know what is expected of them. You can: Take a stand. Fortunately I rarely have to work with people who can’t be bothered. That lack of commitment is a problem for me, so I would be putting them under formal performance management (or asking their manager to do it). Their options are shape up or get out. Your team is too busy to carry someone who doesn’t want to be there. #2: They don’t have the skills to do the work. You can: Find out if they are struggling. Maybe the work is too hard or too complex for them to manage alone. If they don’t have the skills to complete their tasks it will look like they aren’t taking fully responsibility but actually they can’t. Offer training if necessary. Worst case scenario involves removing them from your project team and replacing them with someone who can do the job. It is also worth looking into the Situational Leadership model if you aren’t familiar with it. It is based on assessing the Skill (ability) and Will (attitude) of the people on the team and changing your management style accordingly. People who are willing but lack the skill are keepers – you can coach them through their tasks or offer them training. Then hopefully they will take responsibility for future similar activities. #3: They don’t know how to manage their time or tasks. You can: Help. Everyone can learn how to manage their time and their workload. You are probably quite good at it and have a lot to offer: developing your team is also part of the project manager’s responsibility. The difficulty here is that it’s embarrassing to admit that you are not. Therefore you might have to guess that this is the real reason why they aren’t stepping up. #4: They don’t have the time. You can: Help them focus. This is a different problem to the one above. In this situation they have their ‘normal’ work to do and they don’t have the time to take on tasks for you as well. They need help defining their priorities so they aren’t spending time on low priority work when they should be doing high priority project tasks. You may have to involve their line manager or the other people giving them tasks as you can’t just waltz in and say your work is more important. Prioritise everything together and if your work doesn’t come out on top then you’ll have to manage around that decision. #5: The work is too easy or they think it is boring. You can: Find ways to make work more interesting or appealing. People who don’t take their project work seriously or don’t want to engage with you or their tasks lack the will to work on what you have allocated to them. Making it more challenging by giving them responsibility might actually make it better for them. #6: They never signed up to the plan and they think it’s unrealistic. You can: Avoid this situation by letting people set their own deadlines. Or at least negotiate the deadlines with them – don’t impose deadlines on people. There’s more in this article about how to manage your project plan when your team doesn’t believe in the schedule. #7: They don’t trust or respect their colleagues. You can: Panic (just a little bit, away from anyone who will see you) because this is a difficult situation to resolve. If the team doesn’t get on because there is baggage and a general feeling that there’s no point in working together because their colleagues are losers, then that’s a challenge. You probably won’t have the full history of what has gone on. Focus on building good relationships between individuals and let the team come together as a team later. You’ll also have to get to the bottom of why there is no respect: what is it exactly that individuals have done that has made the respect inherent in the workplace disappear? That explains some of the reasons why people might fail to step up on the team. Now let’s look at more things that you can do about it. Make it easier to work together than work separately. Use collaboration tools, shared network drives, email distribution lists. Get everyone on them using them correctly. Reward sharing/collaboration by calling it out and thanking people for their efforts to work together. Team building that focuses on explaining what other people actually do. When you don’t understand your colleagues’ jobs it is too easy to believe they do nothing all day but create problems for you. Get everyone to sit together. Move desk allocations around so the people who work together the most sit closest to each other. Finally, here is a technique I learned from Get-It-Done Guy (a great resource, if you don’t know him already). Emily then has an incentive to do the work by the deadline and get the meeting cancelled. If she doesn’t deliver, you hold the meeting and use it to work with her or stand over her until you get what you want. This is not the ideal use of your time (or hers) but at least you get what you want by the deadline and it doesn’t hold you up. If she does deliver, cancel the meeting and everyone is happy. I really like this approach and am looking forward to trying it out. Luckily for me, I don’t work with very many flaky people so I might have to keep this technique in reserve until I really need it. Be responsible for helping people take responsibility. Be responsible for helping people take responsibility. I’ve been in meetings where someone asks me for a progress update when the person doing the work is sitting next to me. I’ve been copied in on emails where the sender is asking me to ask someone else a question and then copied in the person who will answer the question! Facilitate responsibility by not rising to these situations. It also helps break down silos because you force the right people to speak to each other. When people look at you for the answer, pass it on. “Adam, that’s a question for you.” Don’t micromanage – because that is what they are looking for. Tom Kendrick’s book Results Without Authority* is very good on influencing and how to make people do things when they don’t work for you. Stever Robbins, the Get-It-Done Guy, is the author of Get-It-Done Guys 9 Steps to Work Less and Do More. Read my review of his book here (short review: one of my all-time favourites on productivity and time management). If you are getting paid to do your job, it is your responsibility as a paid adult employee to do your job. Period. No one should have to entertain you or hold your hand. I’m sorry, but this is not Kindergarten, It’s your job or in some cases your career, in which you need to do in order to get paid and pay your bills, and be a responsible adult. No excuses. If you find yourself bored at work and don’t want to do what you are paid to do, find another job/career. The paycheck you receive for the work you are responsible for completing isn’t shared/split with your colleagues that work hard while you slack! So now paid employees need to be specially entertained while getting paid? Sounds like extra work for the other people in the office that already work hard. Elizabeth, I believe you are approaching this problem from the wrong side. By making judgements about people like “they are lazy” you would only increase animosity and destroy respect within your team. 5. They lack motivation (boring, no challenge, conflicting priorities or even mental health issues). Usually, by the time you have sorted out first four,the fifth is not a problem anymore. While as when you start with the fifth, you’ll end up working in the environment filled with lazy jerks. Hello Sergey. Thanks for your comment. I didn’t mean for those 7 points to be in order of importance. I agree that there are a variety of reasons why people don’t take responsibility for tasks or don’t do the work they have been assigned. Laziness, as I said but perhaps didn’t make clear enough, is by far the least common reason I’ve come across. However, I would say that if you do have someone who fits that profile, calling them out on it and dealing with it for what it is would have the potential to increase respect amongst other team members as they would no longer have to pick up the slack. Undermanagement is a real cause of issue and a manager who can act in tough situations and not let things ride is often what takes teams to the next level. Thanks and very good points. … i am sharing with my friends and colleagues. of this website; this web site includes awesome and truly excellent stuff for readers. I’m a new reader. I find your stuff extremely good. Thanks very much for posting it. You wrote, “I’ve been copied in on emails where the sender is asking me to ask someone else a question and then copied in the person who will answer the question!” What’s your take on emails to a responsible party that also copy that person’s supervisor? (as if to say, “I copied your supervisor, so you better respond to this”) My thought has been that if I want to involve the supervisor, then I should write to the supervisor (and copy the supervisee), not the other way around. Or perhaps that’s just my pride talking and it really doesn’t matter. What’s your thought? I agree with you – copying the manager implies you don’t trust the individual to do any work unless their boss knows about it. Unless I am emailing to say ‘well done’ I don’t copy the supervisor routinely. I think it’s far better to speak to a line manager if you have concerns about the performance of their staff. Oh, and thanks for the nice remarks! Glad you enjoy the blog. Thanks. I like these points and well said..